Why Staff Augmentation became trendy? Organisations are choosing to use Staff Augmentation more and more these days; both for strategic and tactical projects. r10 have noticed the increased demand for our Staff Augmentation services and we believe this trend is here to stay. Augmentation is the purchase of a managed service. It gives access to a specialist pool of talent which can result in improved project output and offer a smoother path to the desired future state. It ensures that skilled professionals add value to your existing team that match specific project requirements, when the organisation does not have the internal capability to do so. It is a mechanism to provide help on a scalable, per project basis and makes it easier for our clients to focus on their business goals. Are you still wondering what the benefits are? 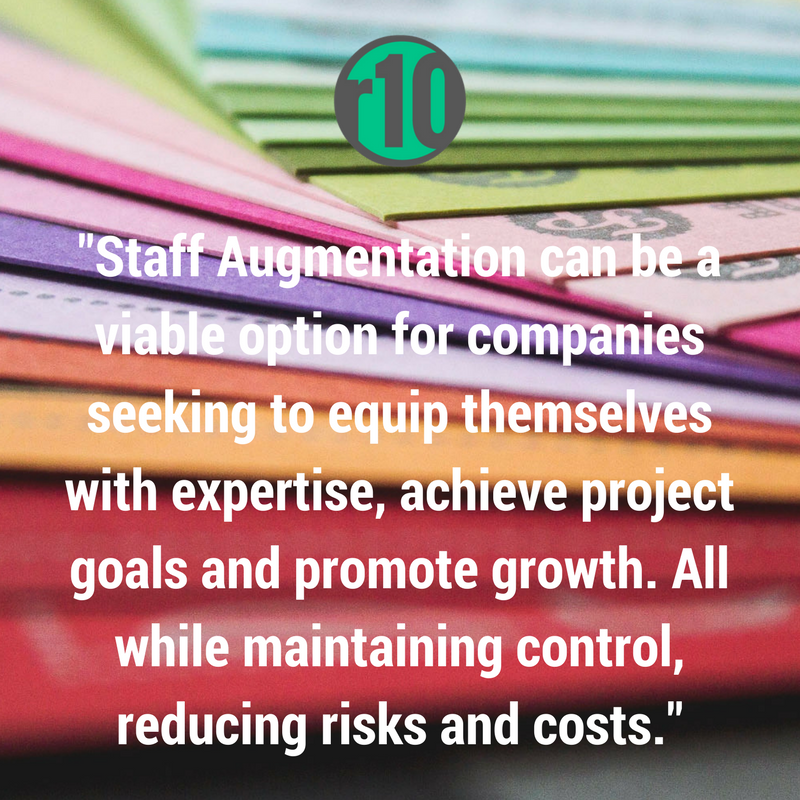 Choosing r10’s augmentation services gives access not only to skills, but the realisation of clear project objectives. It removes the need for an organisation to add costs by hiring permanent employees and mitigates the risk of managing contractors. 2. Time-saving without administrative complications. Many of our clients discover that they can onboard consultants more quickly than full-time employees. The process does not involve HR or the additional time required in reviewing CV’s and extensive interviews, as we provide these sections of the process. It allows the budget controller to act and react to the resource needs of the project without the additional burden of internal HR process. The goal is to ensure the client’s success. We manage the onboarding (and eventually the offboarding) “hustle” by evaluating consultants’ capabilities and cultural fit. We reduce our clients’ selection process and administration effort. We give our clients back time to do their jobs and to add benefit to their projects. 3. Cost savings and flexibility, without sacrificing quality. With Staff Augmentation, organisations can reduce business costs and increase profitability. The model gives clients the flexibility to add, subtract or ring-fence resources to match the demands of any project, without the need of paying employees all year round. This flexibility, beyond its financial benefits, allows organisations to respond faster to change and exploit agile growth opportunities. 4. Maintain control, fund outcomes and reduce risk. With the augmentation model, a client funds a service where we are committing our resources to deliver specific outcomes, within a particular time period. We are responsible for providing project lead for managing and providing oversight to the consultants. Staff Augmentation removes risks from the client but still gives them control. By augmenting into the existing staff in-house capabilities, we often see client’s staff become more empowered. This is opposite to outsourcing. Staff Augmentation can be a viable option for companies seeking to equip themselves with expertise, achieve project goals and promote growth. All while maintaining control, reducing risks and costs. This model provides a focused and unbiased workforce that is concerned with providing perspective, meet deadlines and ensuring the client’s success. This model’s numerous benefits undeniably established Staff Augmentation as “trendy”. For more information and a deep dive into our model get in touch.